For Mac OS X 10.7 or newer. Available on the Mac App Store, $6.99. Scroll+ is a simpler version of Smart Scroll. If you bought Scroll+ and it's not running as expected, please email Support for an update that Apple's rules are preventing from being offered in the Mac App Store. 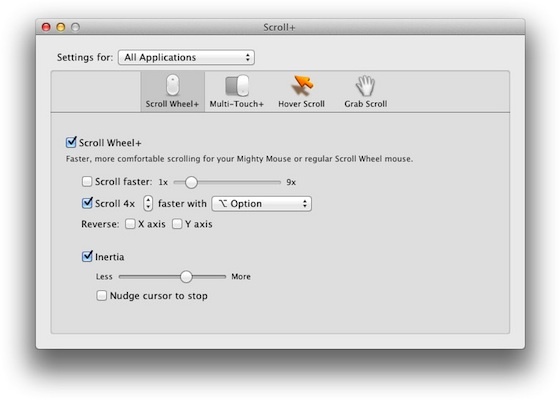 Apps such as Scroll+ which require accessing and modifying scroll wheel and other input received by other apps running on the same Mac, have been automatically rejected by the code checks that are done when an app or an update to one is submitted to the Mac App Store, as Apple has been trying to prevent security breaches. So it's not been possible to update Scroll+ in the Store in any way since 2012, not even for fixing glitches such as where in System Preferences to enable access for assistive devices (since OS X El Capitan 10.11 this is done in the Privacy tab of the Security&Privacy System Preferences panel). A $7 upgrade to Smart Scroll is available. Download and install Smart Scroll, then open System Preferences, click Smart Scroll, and click the Register button to purchase the upgrade.